Sphenoidotomy is the surgical opening of the sphenoid sinus. The sphenoid sinuses are central aerations of the sphenoid bone that start developing at about 3 months’ gestation. Their development initiates as a vagination of the cartilaginous cupular process and continues to enlarge until the teenaged years. Because of the high variability of sphenoid sinus pneumatization, the boundaries can differ from person to person. The anterior boundaries of the sphenoid sinus are likely the most consistent. They include the sphenoid crest anterosuperiorly, which articulates with the perpendicular plate of the ethmoid bone, and the rostrum anteroinferiorly, which articulates with the vomer. The posterior boundaries of the sphenoid sinus usually include the sella turcica medially and cavernous sinuses laterally. Hamberger described 3 types of pneumatization based on its relationship to the sella turcica: conchal (rudimentary or absent sphenoid sinus), presellar (a posterior sphenoid sinus wall that is separated from sella by thick bone), and sellar (a posterior sphenoid sinus wall that is adjacent to sella). The most common configuration in his series was the sellar type, found in 86% of the population, compared to the presellar type (11%) and conchal type (3%). Authors have described a quite common fourth configuration, postsellar type, in which sphenoid sinus extends beyond the sella turcica so that the sella forms a portion of the roof of the sphenoid sinus. In addition, the optic chiasm and internal carotid arteries are often intimately associated with posterior or lateral walls of sphenoid sinus. The lateral limits of the sphenoid sinus vary greatly. 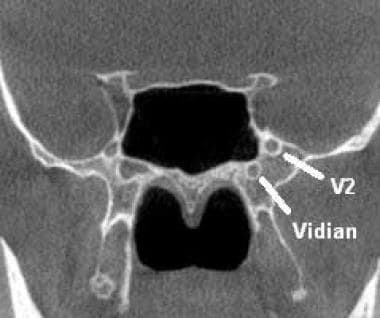 The inferolateral area of the sphenoid sinus carries the vidian nerve, and the superolateral area carries V2 in foramen rotundum. Coronal computed tomographic image of the sphenoid sinus demonstrating the location of cranial nerve V2 and the vidian nerve. The lateral extent of the sphenoid sinus may extend to or beyond these nerves. The posterior septal branch of the sphenopalatine artery runs a few millimeters below the natural os of the sphenoid sinus. Sphenoidotomy has no absolute contraindications. Relative contraindications include comorbidities that limit general anesthesia or conditions that increase the risk of bleeding. Care should also be taken when performing surgery on a hypoplastic sphenoid sinus or sphenoid sinus cavities with dehiscence of the internal carotid artery or optic nerve. Unoperated right-sided sphenoid sinus os with mucus discharge. The sphenoid os can be seen located just medial to the superior turbinate in this case. Prior to performing sphenoidotomy, the surgeon should carefully inspect the patient’s anatomic variants and extent of sinusitis. The surgeon should also use a standard approach that allows safe entrance into the sphenoid sinus. Stereotactic navigation should be considered, when warranted. In an effort to avoid severe complications, the surgeon should recognize potential pitfalls, such as cerebrospinal fluid leaks from inadvertent skull base injury, blindness from optic nerve injury, hemorrhage from the posterior septal branch of the sphenopalatine artery, or catastrophic hemorrhage from the internal carotid artery. Regardless of the technique performed, care should be taken to avoid vital structures. The optic nerve may traverse laterally, and sometimes superiorly, in proximity to the sphenoid sinus or within an Onodi cell. Care should especially be taken to avoid disturbing the posterior wall of the sphenoid sinus, as this can risk injury to the carotid artery, optic chiasm, cavernous sinus, or pituitary gland. 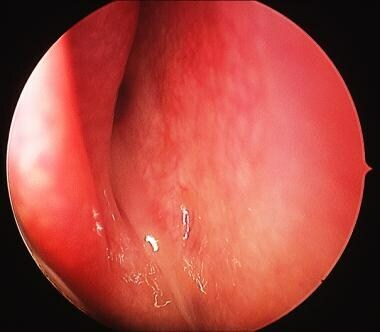 In addition, the surgeon should be aware that the posterior septal branch of the sphenopalatine artery traverses just inferior to the nature os of the sphenoid sinus; thus, removal of bone and mucosa inferiorly may cause inadvertent injury to this artery with resultant epistaxis. Some ways to avoid injury to this artery include elevating the mucosa off the bone or cauterizing the approximate site of the artery prior to performing inferior dissection. If bleeding is encountered secondary to this artery, it is fortunately readily controlled with monopolar or bipolar cauterization. Sphenoidotomy appears efficacious based on case series studies. No prospective randomized controlled trials have evaluated sphenoidotomy. Hamberger CA, Hammer G, Norlen G, et al. Transantrosphenoidal hypophysectomy. Arch Otolaryngol. 74:2-8. Massoubre J, Saroul N, Vokwely JE, Lietin B, Mom T, Gilain L. Results of transnasal transostial sphenoidotomy in 79 cases of chronic sphenoid sinusitis. Eur Ann Otorhinolaryngol Head Neck Dis. 2016 Sep. 133 (4):231-6. [Medline]. [Full Text]. Beswick DM, Ramadan H, Baroody FM, Hwang PH. Practice patterns in pediatric chronic rhinosinusitis: A survey of the American Rhinologic Society. Am J Rhinol Allergy. 2016 Nov 1. 30 (6):418-423. [Medline]. David A. Kieff, MD; Micholas Busaba, MD. Treatment of Isolated Sphenoid Sinus Inflammatory Disease by Endoscopic Sphenoidotomy Without Ethmoidectomy. The Laryngoscope. December 2002. 112:2186-2188. Carl W. Moeller, MD; Kevin C. Welch, MD. Prevention and Management of Complications in Sphenoidotomy. Otolaryngology Clinics of North America. 2010. 43:839-854. Cheng Y, Xue F, Wang TY, Ji JF, Chen W, Wang ZY, et al. Analyses and treatments of postoperative nasal complications after endonasal transsphenoidal resection of pituitary neoplasms. Medicine (Baltimore). 2017 Apr. 96 (15):e6614. [Medline]. [Full Text]. Yadav YR, Nishtha Y, Vijay P, Shailendra R, Yatin K. Endoscopic endonasal trans-sphenoid management of craniopharyngiomas. Asian J Neurosurg. 2015 Jan-Mar. 10(1):10-6. [Medline]. [Full Text]. Thamboo A, Chang BA, Habib AR, Manji J, Hathorn I, Sunkaraneni V, et al. The effect of two sphenoidotomy approaches on the sense of smell: trans-ethmoidal versus trans-sphenoethmoidal. Rhinology. 2014 Sep. 52(3):281-7. [Medline]. Hyun-Ung Kim, MD; Sung-Shik Kim, MD; Seong Seok Kang, MD; In Hyuk Chung, MD; Jeung-Gweon Lee, MD; Joo-Heon Yoon, et al. Surgical Anatomy of the Natural Ostium of the Sphenoid Sinus. The Laryngoscope. 2001. 111:1599-1602. Jiang RS, Liang KL. Image-guided sphenoidotomy in revision functional endoscopic sinus surgery. Allergy Rhinol (Providence). 2014 Jan. 5(3):116-9. [Medline]. [Full Text]. Left-sided sphenoidotomy site at 6 weeks postoperatively from removal of sphenoid sinus fungal ball. Disclosure: Serve(d) as a speaker or a member of a speakers bureau for: Acclarent; IntersectENT.